Though we're still in the dark about how there's so much more matter than antimatter. Antimatter is a particularly difficult aspect of our universe to study, since it has a funny way of annihilating itself when it comes into contact with matter. This makes it impossible to properly study these particles by any conventional means of measurement, and scientists had to devise a way of using magnetic fields to “trap” antiparticles in order to get a better look. 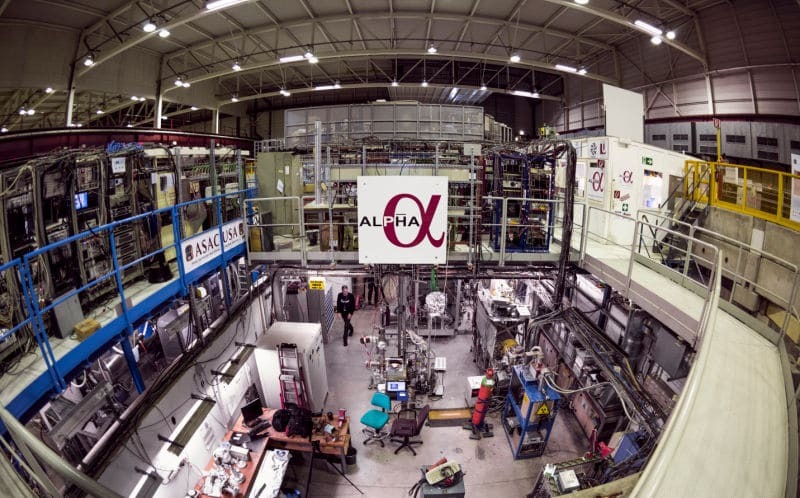 Progress was made in 2010 when CERN’s ALPHA collaboration was able to trap antihydrogen and proceed with some unprecedented study. As reported to Nature, CERN scientists were recently able to finally measure the frequency of light needed to move the antiparticle from a ground state to an excited state. This was accomplished using cooled antiparticles and firing a laser at them to induce the shift change, then measuring that shift using spectrography. The results confirmed an important symmetry that’s a key part of the standard model of particle physics. According to Nature, “Charge-parity-time (CPT) symmetry predicts that energy levels in antimatter and matter should be the same. Even the tiniest violation of this rule would require a serious rethink of the standard model of particle physics.” The standard model is safe for now as the frequency measured in the antihydrogen shift from grounded to excited matched the shift observed in hydrogen. The ALPHA team’s work is far from finished. They plan to throw a variety of laser beams at these trapped antiparticles to further test the fidelity of the symmetry found in the original study. The mystery of how there is more regular matter than antimatter in the universe is further complicated by this discovery since it reinforces their similarity. As Gizmodo puts it, “This would be easier to explain if matter and antimatter were less similar.” Still, we have finally made some measurable progress in the study of antimatter. It is only a matter of continued innovation in both knowledge and technology to ensure that we someday solve this mystery. Would it Be Possible to Build a Death Star?